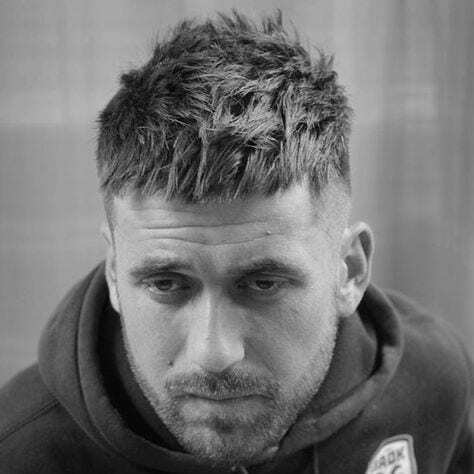 Are you looking for a stylish cut that will keep you looking trendy? 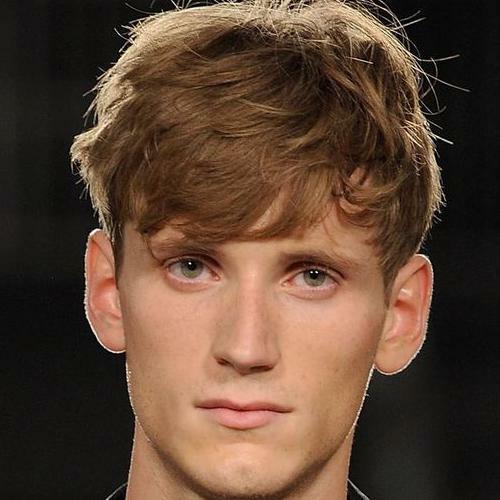 Believe it or not, but short hair with bangs is in for men’s fashion. 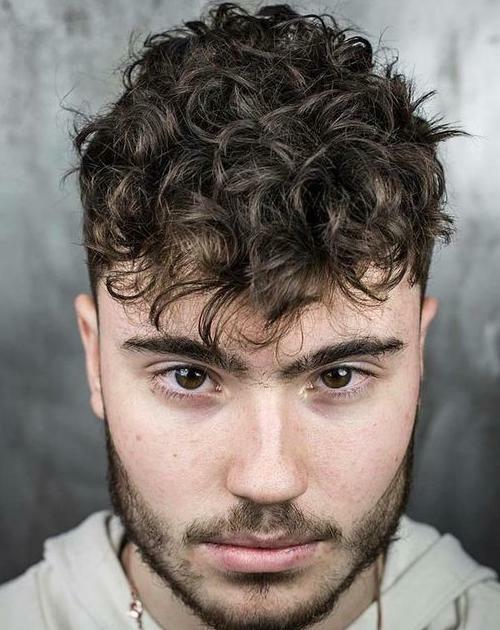 If you’re looking for a way to upgrade your hair game, below we’ve compiled a list of the 48 best fringe haircuts for men. One thing you’ll probably notice over and over again is the excessive amounts of texture in most of these styles. One of these haircuts is sure to give you inspiration for your next ‘do, so keep your eyes peeled! If you’re someone who doesn’t play by the rules, this haircut is for you. This textured fringe style screams bad boy, but it’s still sophisticated enough to keep you from looking like a delinquent. 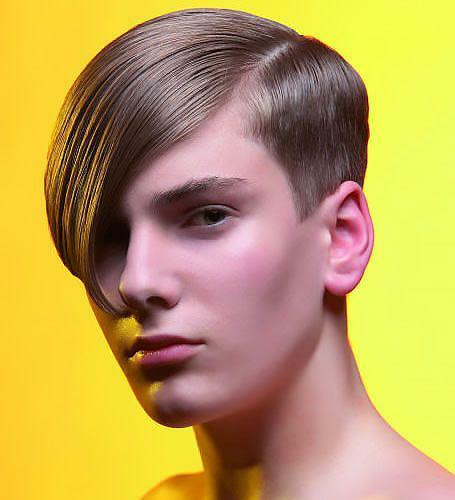 Low maintenance and stylish, this cut is sure to keep you looking trendy with little to no effort required. Pushing the envelope is the name of the game for this style. It’s really about how edgy you’re willing to go in the name of fashion. 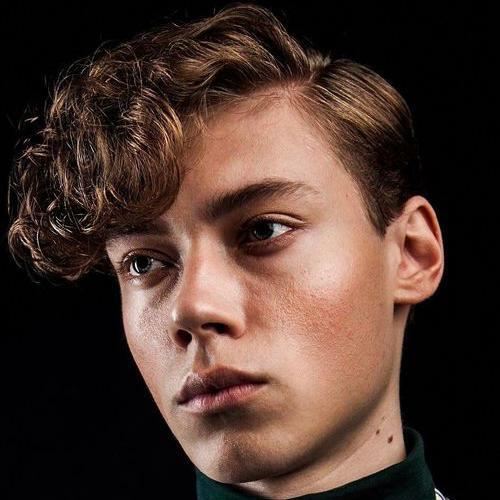 High fashion trends are starting to trickle their way into mainstream hairstyles for men, so who knows? You could be one step ahead of the curve on this one. 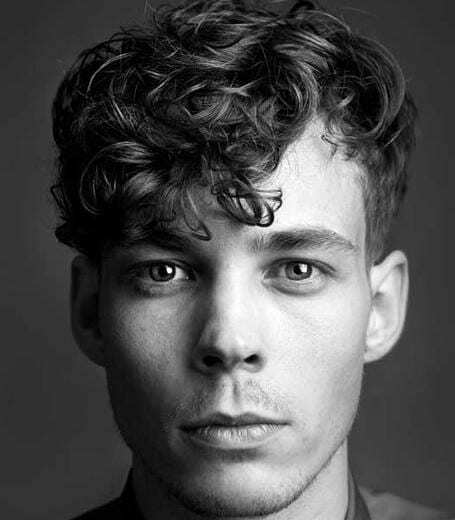 Fringe with good texture is an absolute classic, which is why we’re bringing back this messy pompadour look. It’s an oldie but goodie, so if you’re aren’t hip to high fashion or the latest trends, then this may be the perfect look for you. Channel your inner rockabilly and rock this hairstyle this year. 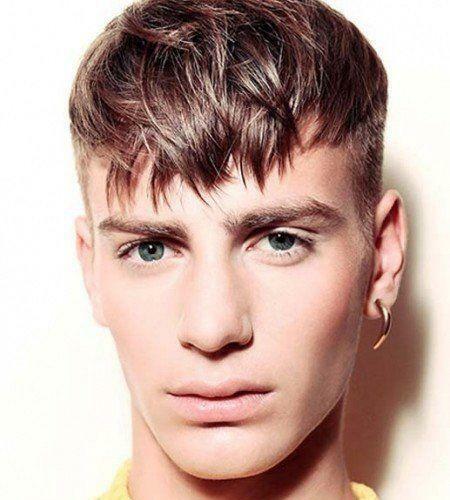 Another great high fashion look for men who are interested in angular fringe. 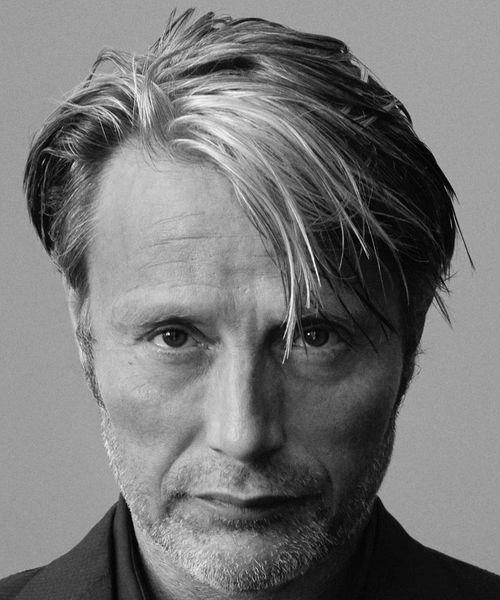 Sharp angles with no layers make for a very intriguing look, which pairs nicely with high cheek bones or chiseled features. Not many men can pull this look off, but those who can are sure to stand out of any crowd. Breaking the mold and going against the grain are all core tenants of the punk rock movement. 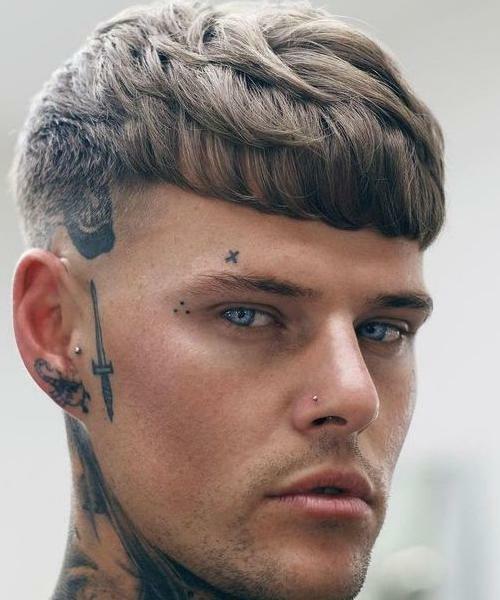 Fringe bangs on men, especially in this style, are a great way to flirt with the punk rock principles without fully investing. 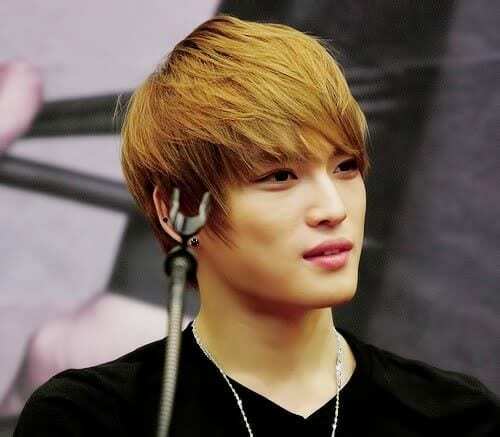 This hairstyle is for a man who isn’t afraid to look different because he knows he still looks great. Looking aloof and laid back can be desirable traits to have. Choosing the right hairstyle is an integral part of this process. With this hairstyle you’ll look like you have better things to do than fix your hair, but your hair will still look great. How does he do it? If the 50s aren’t really your bag, then maybe you should try going back a little further. 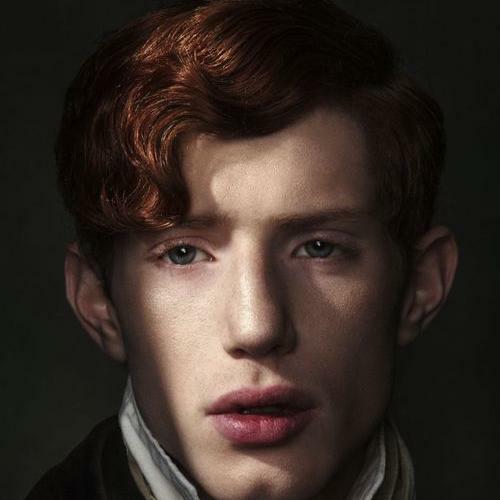 This is a modern take on a distinctively 18th century hairstyle. The curled fringe adds personality to an otherwise conservative choice. Side bangs make for a great way to frame your face and bring out your eyes. Everyone knows that curly fries are better than regular fries. The same holds true for curly fringe vs. regular fringe. 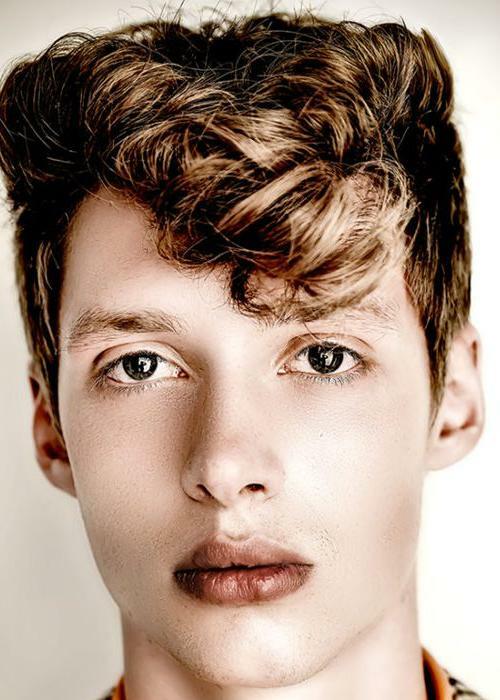 This style is a great way to combine a messy hairstyle with a sleek look to keep your cheekbones visible. We definitely love a look that allows the natural hair texture to show through. 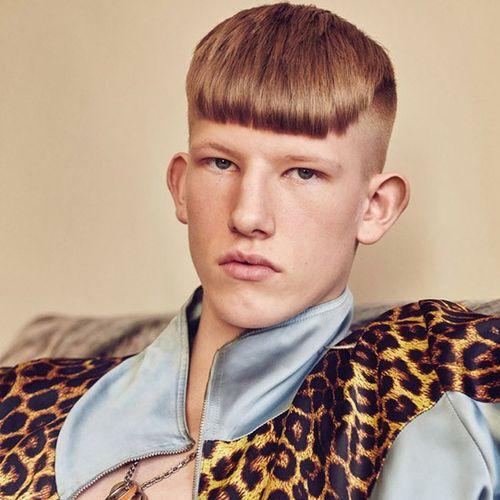 The traditional bowl cut hairstyle has gotten a bit of a bad rap. Why not bring it back into fashion with this modern take on it? Styled the right way this fringe style keeps the look interesting yet simple, messy yet controlled. 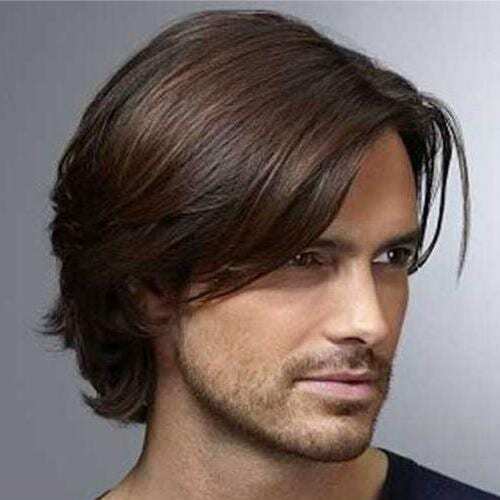 The simpler the cut the less maintenance it requires as well, which is great for many of the men out there. If you’re looking to make your face appear longer and thinner, this style is the best way to do it. 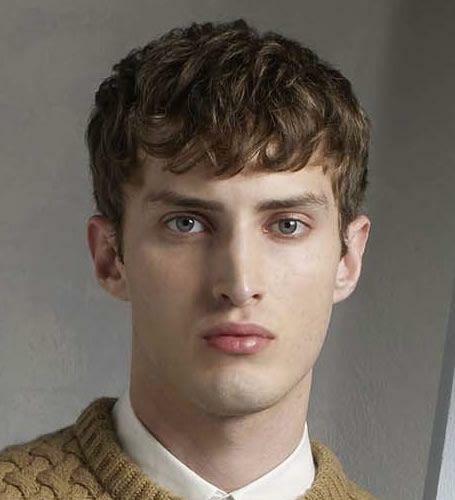 Similar to the curly fringe hairstyle a few cuts back, this look may require a little more hair gel. 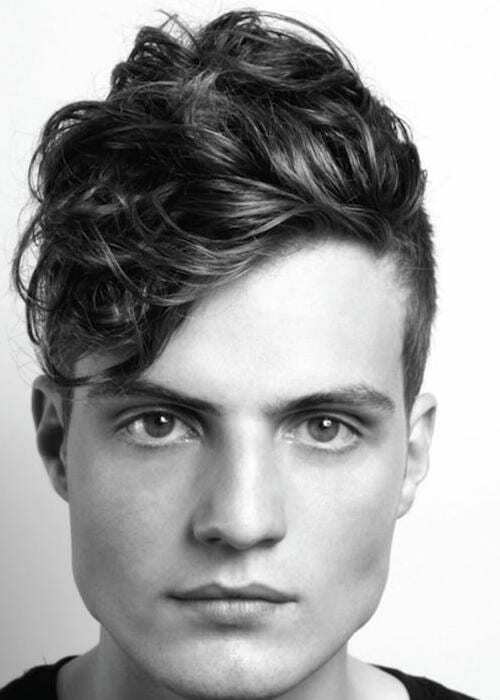 Regardless, the curls will not detract from your angled features; they will actually enhance them. 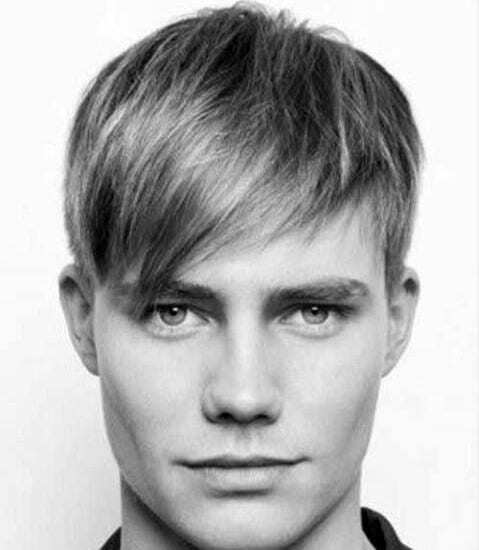 Boyish yet sophisticated are the main highlights of this men’s fringe haircut. This is a very traditional, somewhat conservative fringe hairstyle that doesn’t immediately scream, “I have a fringe.” This allows you to follow along with the fringe trend, look fashionable, but still stay a few steps away from looking like everyone else. Keeping the look messy is a great touch. This fringe is so long it could almost be a man-bun. The sides are buzzed off so you’ll look rough and edgy, while the long fringe maintains that you know how to take care of your appearance. We love a style that looks like it took you half an hour to perfect in the mirror. Looking and feeling great has never been this effortless. It’s the stuff right out of an adventure novel. 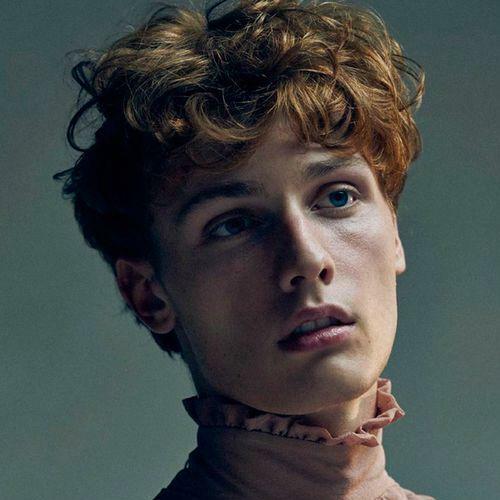 This look is messy and sweet, with a little edge that implies you might be related to Peter Pan. With the right attitude paired with this fringe, the possibilities are virtually endless on what you can accomplish. Short, disheveled, but still put-together describes this ‘do perfectly. 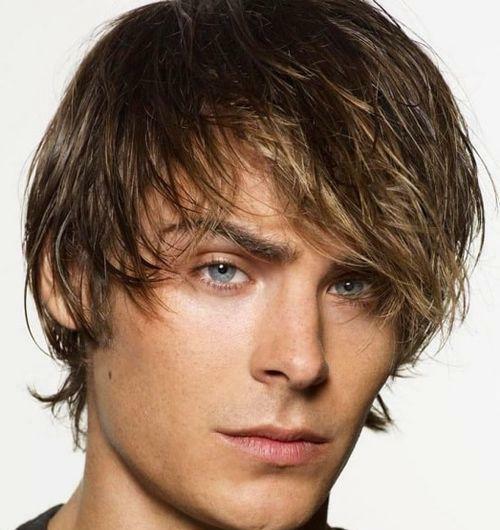 Some of the most popular male celebrities either have this hairstyle or have had it in the past. It’s a good wavy look that takes minimal effort to pull off. 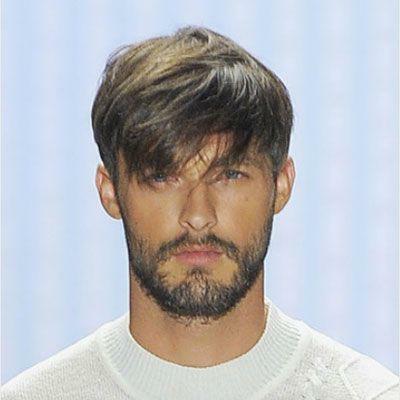 A men’s fringe haircut doesn’t have to be sleek or angular; it can be rugged and wild and still carry a fashionable weight to it. 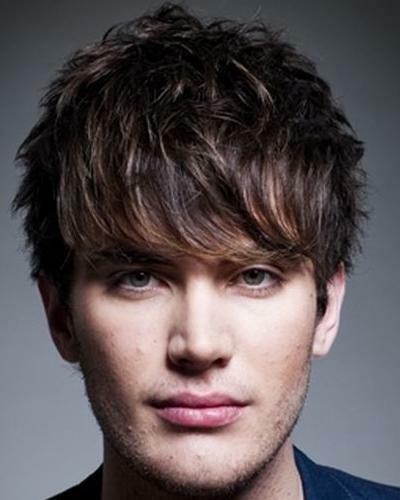 The side fringe is a very good way to bring an interesting dimension to your haircut. Brushing the hair forward from the back also adds another element to this style. People will know you spent time on your hair, but not too much. 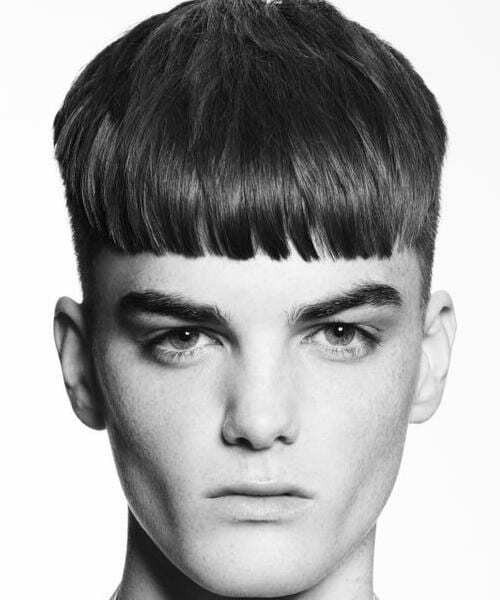 This is another classic cut that takes its inspiration from older men’s fringe haircut styles. Be the captain of your own fate and choose to undertake this handsomely disheveled look. The off-center tilt can complement an asymmetrical face while drawing attention to what is probably one of your best features: your eyes. Let this textured fringe style inspire you to look fantastic every day. Don’t be fooled; there’s a lot more going on with this hairstyle than first meets the eye. It is fairly unassuming and moderate, while staying fashionable and keeping texture, texture, texture at the forefront of it all. This is also a low-maintenance look for the man-on-the-go. 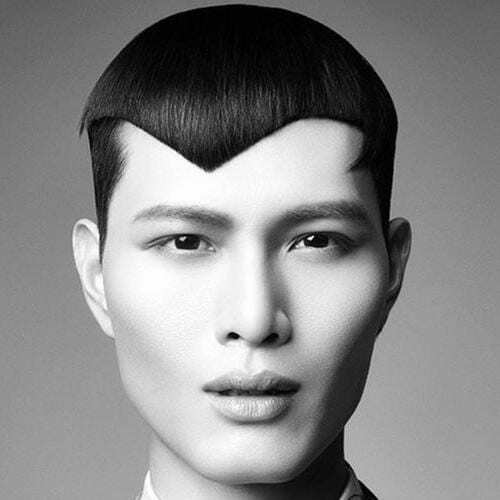 Taking inspiration from Korean pop stars, this men’s fringe haircut is well put together without much room for mistakes. Shadowing the eyes with the side fringe allows the rest of the facial features to stand out nicely. This look is almost the equivalent to a smokey-eye in makeup. Carefully sectioned-off pieces of hair frame the face and add a bit of mystery. It is almost too long for a business atmosphere, but pushing the envelope is all part of the fun. 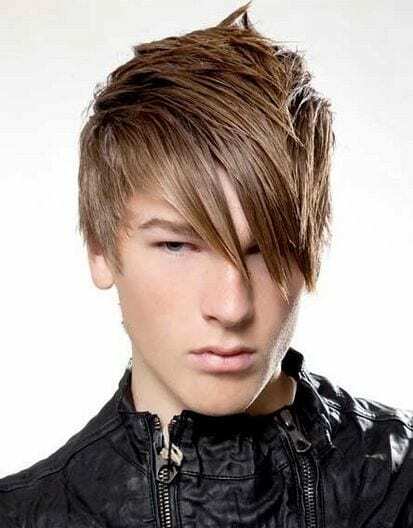 Keeping the fringe long and sleek allows the wearer of this style to remain well-groomed and fashionable. Typically, when you say “beach waves” in association with a hairstyle you think long, bleached-blond hair. In this case the hair is a bit shorter and it isn’t very blond, but the waves are definitely still there. 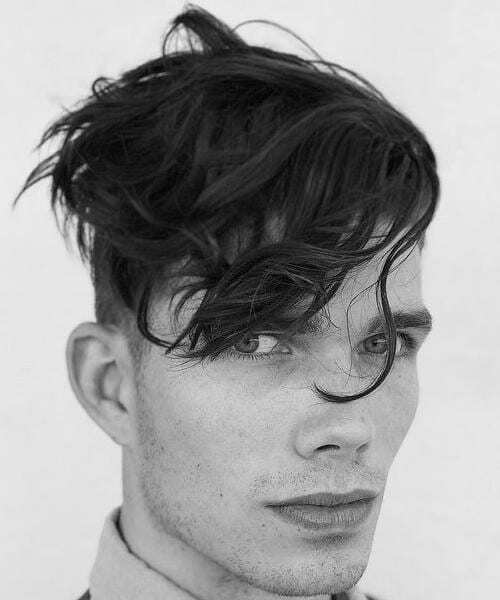 Waves evoke movement and flow, which works brilliantly for this men’s fringe haircut. 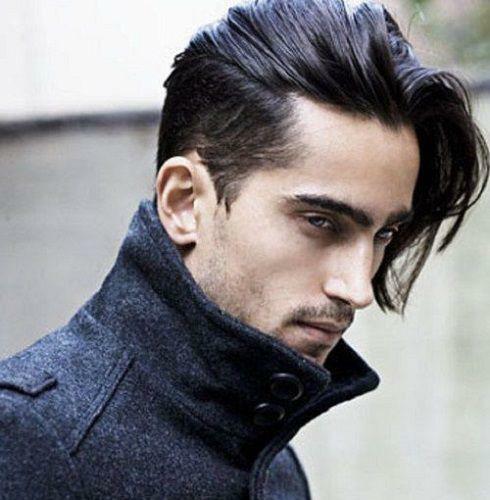 Undercutting long hair makes the hair on top appear thicker, and it’s a pretty intriguing combination. Wear it down or pulled back in a man-bun for a versatile look. It’s an easy way to style your hair and it gives you options to suit your mood. Almost any great fringe can be paired with an undercut to add a little drama. The crop hairstyles are bold and dynamic, and the symmetrical look gives it an air of rigidity. 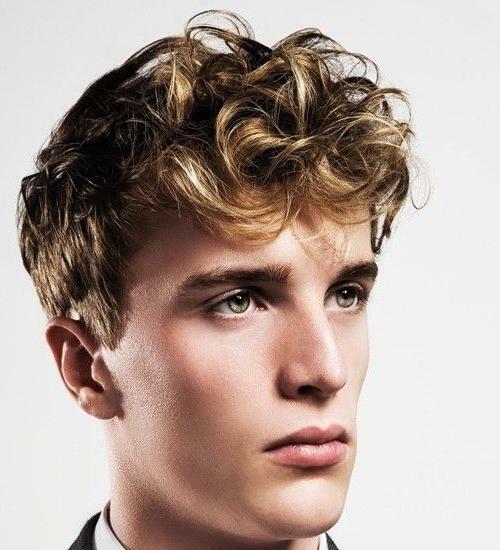 The slight texture gives this hairstyle great personality. This fringe bangs style requires little to no maintenance, and you won’t have to spend much time in the morning perfecting your hair. You’ve heard of slicked-back hair, now get ready for slicked-over. Perfect for straight hair, this cool look is slick and sophisticated (did we mention slick? ), and while it may require a bit of maintenance it is well worth it. Sharp edges create an interesting look against smooth features. Similar to the french crop, this textured fringe offers a lot of options. 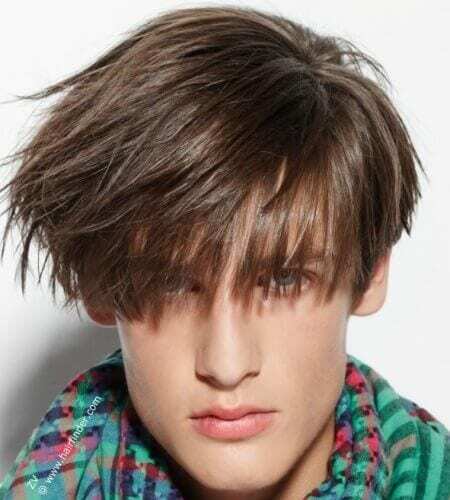 Wear-ability is a big factor when it comes to deciding on a haircut, and this crop abounds in it. Brush it back for a relaxed look or style it forward for a different, edgy take on the fringe. Women aren’t the only ones who can make fringe work, just like they aren’t the only ones who can make a bob cut work. This style can easy be pulled back and away from the face for a more open look, or left down with the extra-long fringe hanging in a mysterious, concealing manner. The choice is yours. 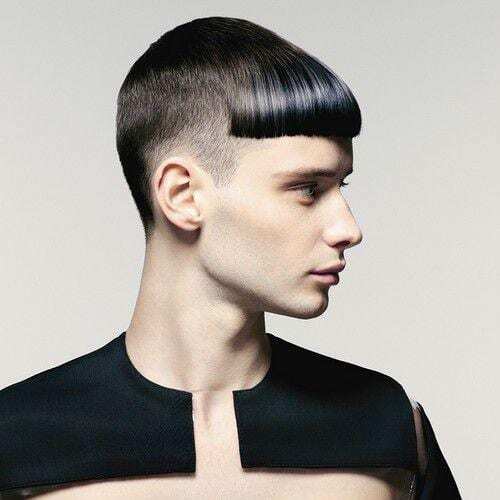 As dramatic as it is elegant, this bold undercut with a fringe worn to the side leaves little to be desired. It’s almost as if a young Patrick Swayze walked into a modern-day hair salon and asked them to take a little off the sides. A textured side fringe worn the right way can take you far. It’s relaxed yet put together. 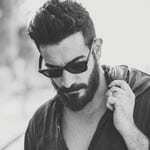 This cut can work for men in almost all walks of life, and the best part is you don’t have to worry much about styling. Just run your fingers through your hair when you’re ready to go! It’s a french crop with a little edge to it. This textured fringe comes to a hazy point in the middle, which brings the eyes further downward. This style allows your face to assume a more V-shaped appearance since it aligns so well with the chin. 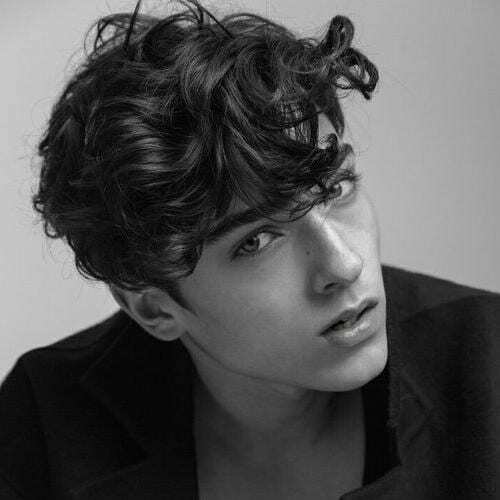 Take advantage of your natural curls (or get yourself some good styling gel) and have fun with a french crop that is loaded with texture. It still looks light and airy, although there is great definition. You don’t want to weight your curls down in this look or slick them down too much. Aren’t ready to commit to a faux-hawk, but like the way it looks? 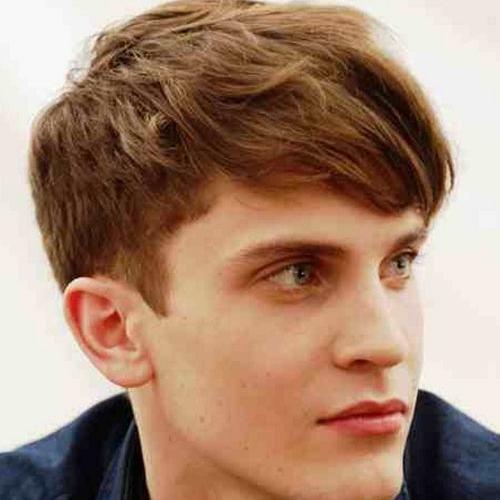 We understand, which is why we suggest this tapered cut that includes a pointed fringe. It’s edgy and bit punk without going too far that you won’t be invited to family gatherings. Yet another option for the hesitant punk who isn’t looking to make too many waves. This is a great textured hairstyle that doesn’t require much work. 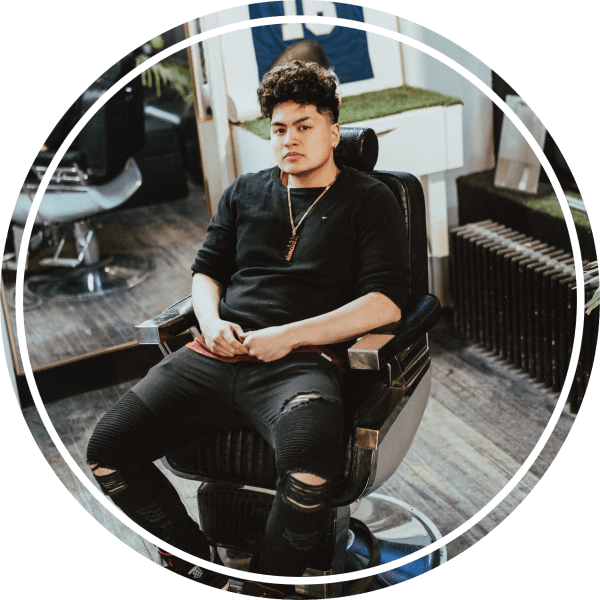 You always have the option of gelling this hair up into the well-known faux-hawk profile, or you can leave it loose and relaxed. We love a good hairstyle with texture. This one has plenty, and the crisp edges make for an appealing look. 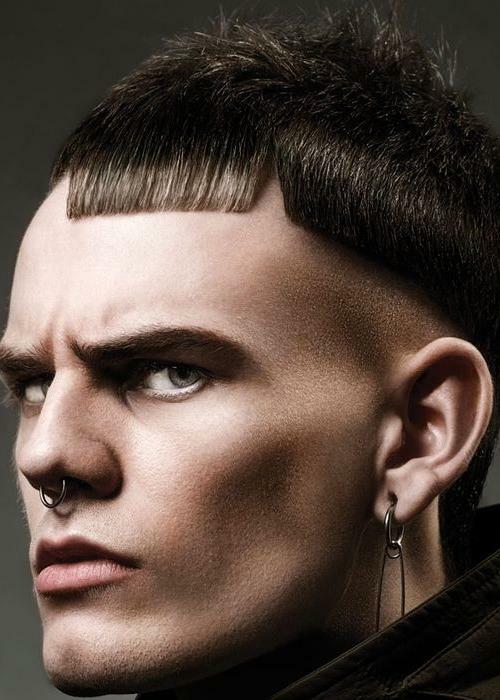 The fade on the sides adds an edgy factor to an otherwise moderate hairstyle. Keep it simple and bring out your eyes — We love it! Messy yet still put together; that’s probably how some people would describe Harry Styles. He isn’t about teenybopper looks anymore though, which is why he’s rocking this great fringe ‘do. The sides and back are longer, but not too long that this ends up looking feminine. It’s all about the gel, gel, and more gel! Some hairstyles look overworked with a lot of product, but others, like this one, require it. The sharp edges and angles are enough to make you stand out of a crowd, not to mention the dramatic difference between the short and long hair. If you have curly hair, rock it! It’s all about working with what you have and knowing exactly how to make it look good. 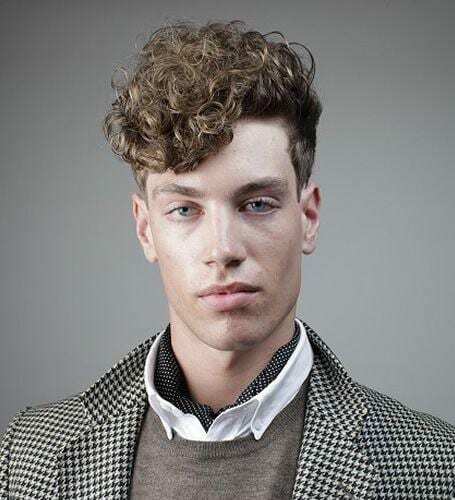 Curly hair all around can sometimes be overbearing, but curls just on top look handsome and sharp. Match that with faded sides and you’ve got one great ‘do. If you have straight hair you may struggle with it looking flat and boring. 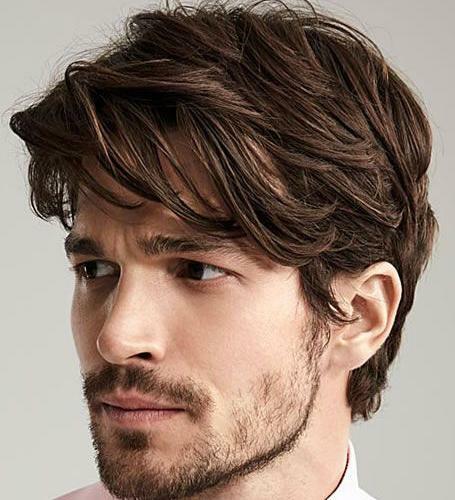 This hairstyle can take any man’s hair and give it volume and texture, which are the two things you absolutely must have for an interesting cut. Bangs swept to one side are definitely trending, so why not get in on this latest fashion? Okay, it’s not exactly long hair. It’s short hair with bangs, but that’s close enough, right? 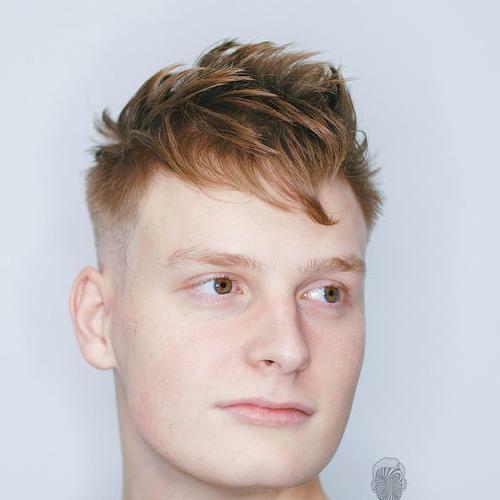 The maintenance on this style is remarkable low, so it’s a great option for any man who is looking to up his style game while keeping it simple at the same time. 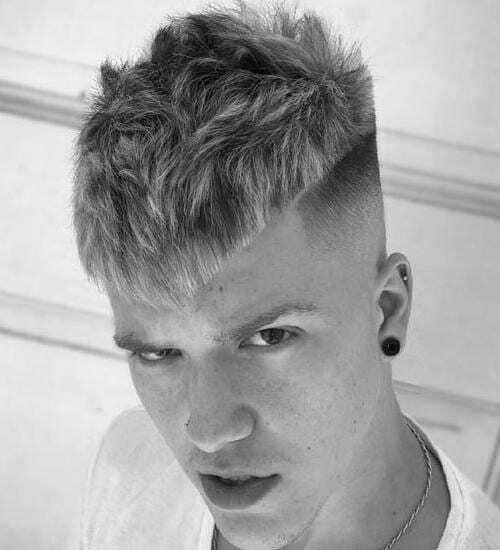 Textured bangs fade into shorter hair on the sides. If you have naturally wavy hair, let that shine through! Don’t weight it down with products trying to get a sleek look, embrace the texture. Controlled chaos looks so much better than smothered chaos in our opinion. A fringe that long perfectly frames the eyes and draws anyone in. 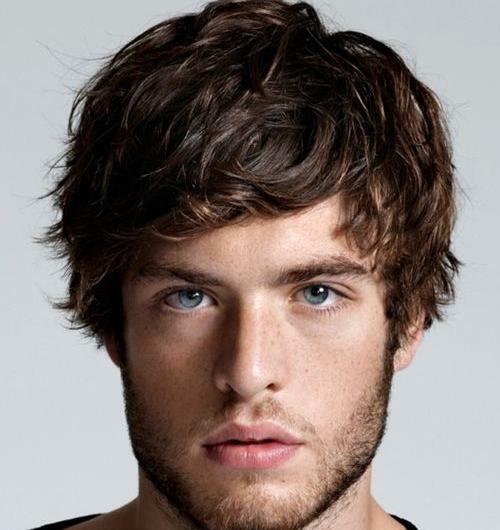 Bringing the fringe to the side allows the naturally wavy hair to stack in an appealing way. The buzzed sides bring the eyes upward while the fringe brings the eyes back down, which makes for a very intriguing style. 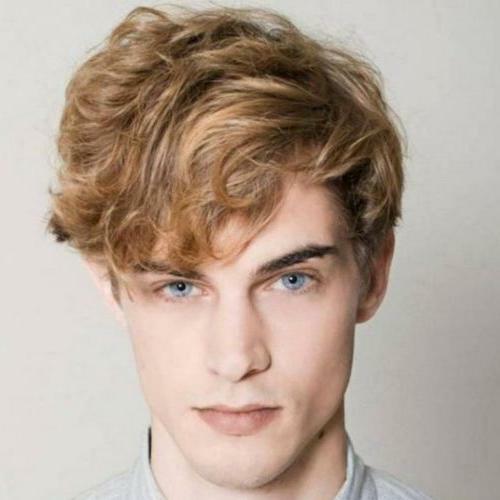 Keep it light on the product and this is a wonderfully low-maintenance cut. Keeping the fringe roughly the same length as the rest of your hair allows for a very carefree style. You don’t have to worry too much about where the hair is falling with this ‘do, you can just kind of let it do its own thing. 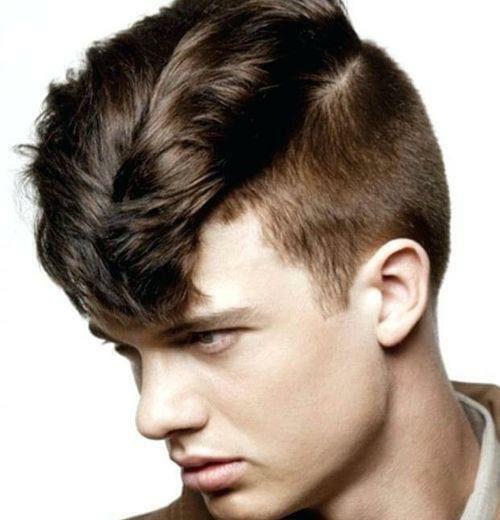 The pompadour hairstyle is finding ways to come back in modern times in styles that might surprise you. 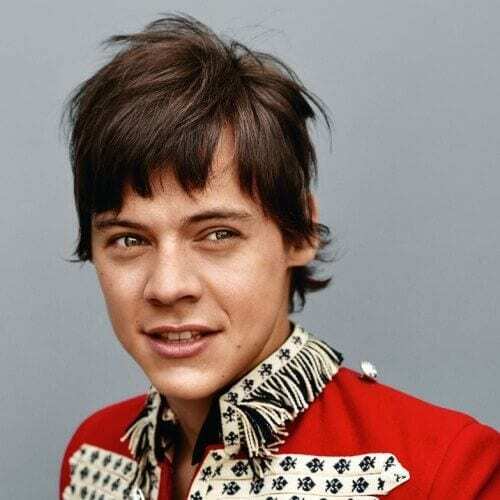 This look is reminiscent of Elvis Presley, but it also contains a bit of an edge that Elvis didn’t have. 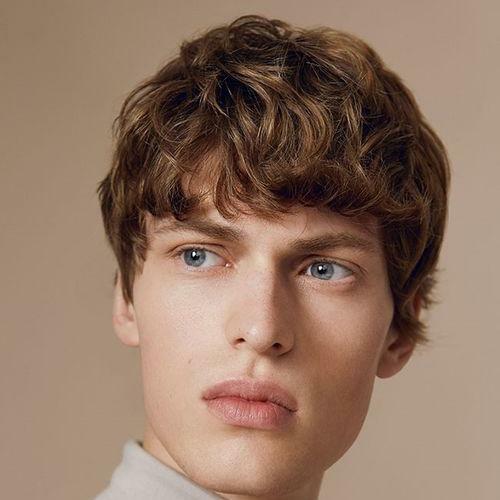 The fringe coming down to a point nicely compliments the short sides as both are somewhat blunt. We’re a sucker for a good side fringe. If you know how to tame your curls then this style is perfect for you. It’s a nice round, soft look that pairs well with the tapered sides. Nothing about it is too extreme, but it’s still a trendy look for anyone wanting to try out a fringe. This reminds us of a modern take on the 80s hairstyle, Flock of Seagulls. We think it’s just bold enough and wild enough to fit well among the more extreme fringe styles. This cut would look good with or without the hairspray. Yes, we love texture, but sometimes less is more. The very small amount of texture in this hairstyle creates a simply elegant crop that is inching its way toward high fashion. It’s still a wearable style, and the faded sides keep it distinctly modern. Forget product, forget styling. Roll out of bed and look flawless with this wave-filled crop cut. 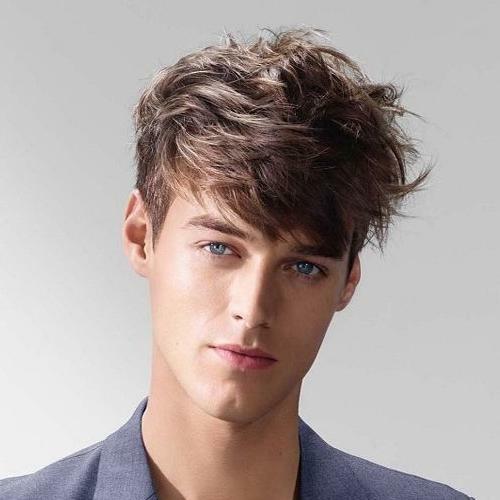 Effortless looks good on anyone, but it look especially good on men with fringes. This hairstyle blends together perfectly for a look with almost no hard edges. 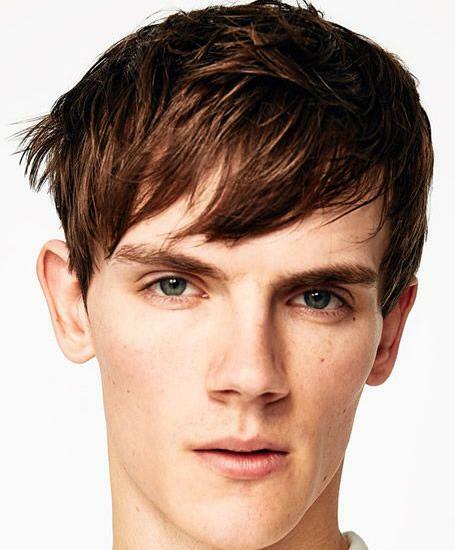 Bangs for men don’t have to cover your whole forehead. As a matter of fact, when you’re dealing with short hair combined with bangs, it’s better if the bangs are a little more angular with less coverage. Keep it interesting on the texture, as always. This is a classic look for someone who spends a lot of time on the beach or in the sun. The fringe is a little sparser than some of the other styles we’ve seen, but the beach tends to do that to you. Let the ocean waves decide where your hair will lie in this relaxed cut. 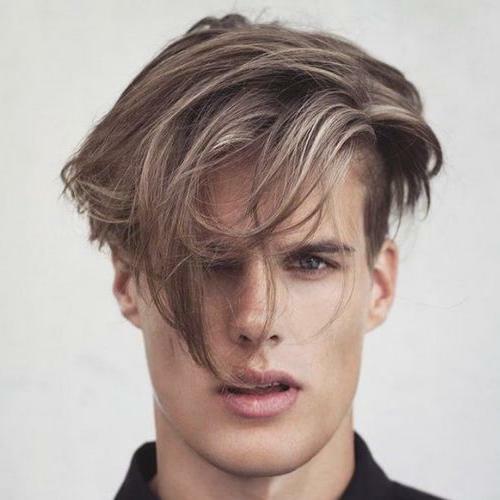 This haircut definitely looks like you could run your fingers through it and have it come out looking just as good. The sides are on the longer side, but not too long, so the fringe is still the center of attention, just like you’ll be with this cut. 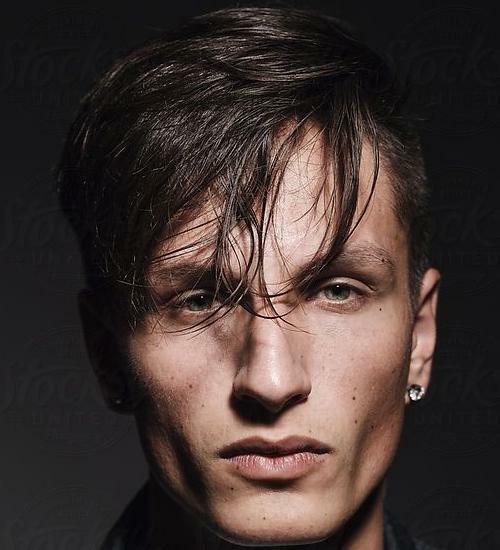 And there you have it, every conceivable hairstyle for men who are interested in trying out a fringe. We’re not saying that you have to try one of these hairstyles, but we’re also not saying you shouldn’t. Whether you want to go simple, high fashion, retro, or something completely wild, always ‘do you! It’s always nice to try something new, so if you liked this list why not share this with a friend who may be looking for a change?